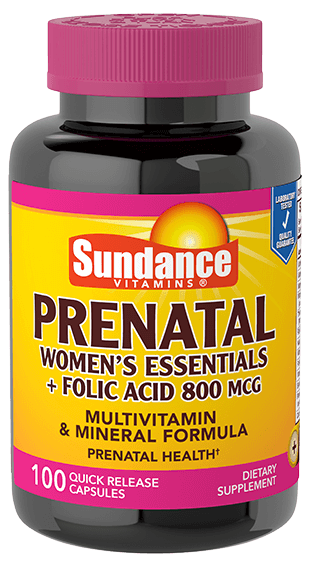 Sundance Vitamins® Women’s Prenatal Essentials is specially formulated with Folic Acid and contains a blend of essential nutrients that are a supportive addition to your routine. Contains fish (cod, cusk, flounder, haddock, hake, pollack, redfish, sole) ingredients. No Gluten, No Wheat, No Yeast, No Milk, No Lactose, No Artificial Color, No Artificial Flavor. NON-GMO. DIRECTIONS: For adult women, take one (1) quick release capsule daily, preferably with a meal.